Philips Hue is the big name in smart lighting, but one of the big problems with jumping into the Hue ecosystem was that the starter kits are a little confusing. Some kits come with three bulbs, others come with two. Some have a dimmer, some don't. Add in different options like color and white ambience and you get some bewildered customers that just throw up their hands in frustration. Philips is hoping to solve that problem with its new starter packs. The $199.99 White and Color Ambience starter pack will go from a bridge and three bulbs to a bridge and four bulbs. The $129.99 White Ambience starter kit will get the largest change, going from a bridge, a dimmer and two bulbs to a bridge and four bulbs and getting a price hike to $149.99. And finally, Philips is adding a $99.99 White starter kit with a bridge and four bulbs. So, the only big decision you have to make is which color you want. Confusion is only one reason the company is simplifying its starter packs. Michael Deschamps, Philips product marketing manager, told Wareable that it found customers would often buy a starter pack plus one or two bulbs on the side to light up their rooms. Of course, that made the true cost of entering the Philips ecosystem more expensive than it is on first blush. And yes, Philips will keep the $69.99 White starter kit with a bridge and two bulbs if you want to enter the ecosystem at a more affordable cost. The company is also announcing two brand new entries in its growing army of Hue lighting fixtures. 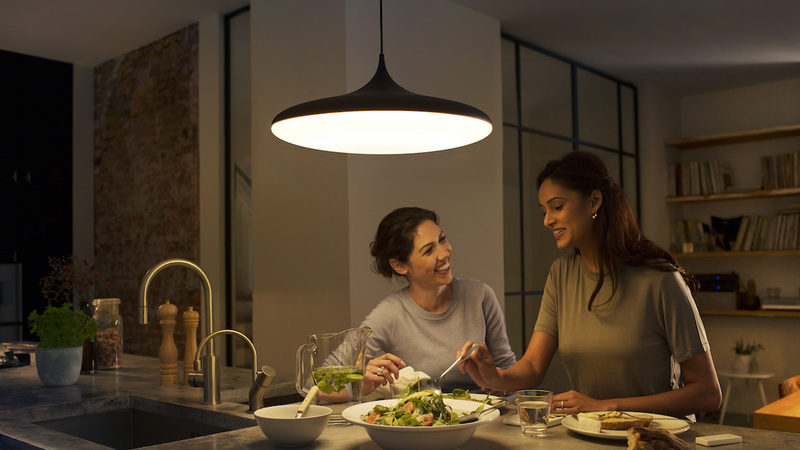 The $229 White Ambience Cher Suspension fixture is a svelte option that's best placed above your kitchen island or dining table, using its 3,000 lumens to push even, ambient white light in all those familiar Hue scenes. The $34.99 White Ambience downlight, on the other hand, is intended to slot into those recessed ceiling light spaces in either 4- or 6-inch variations. So why would you opt for an expensive fixture that you have to install when you can just add Hue bulbs to your existing lights? Especially since Philips keeps debuting new kinds of bulbs, like the new $49.99 White Ambience and Color candle bulb. Deschamps says it essentially comes down to design. The company of course doesn't mind if you want to outfit your existing fixtures with its bulbs, but it also believes that because these fixtures are designed with Hue in mind, they offer lighting that's better distributed than replacement bulbs and something that blends in and allows the light to steal the show rather than the actual fixture. Philips has also announced Hue Entertainment, which is a free software upgrade to V2 bridges and Hue color-capable lights that syncs your lights to your entertainment options. So if you're playing a game, listening to music or streaming a movie, the device you're using will let your Hue Bridge know, which will then sync your lights to your content. It'll arrive in December. You'll be able to get your hands on the new starter kits as they roll out in the first two weeks of September, while the new lighting fixtures and cable bulbs will arrive in October 2017.